“We are pleased to help expand this clean energy technology to new applications,” said Young Brothers, Ltd., President Glenn Hong. Young Brothers is hosting a project led by Sandia National Laboratories to test a hydrogen-fuel-cell-powered generator as an alternative to diesel in powering refrigerated containers. (Photo by David Murphey) Click on the thumbnail for a high-resolution image. HONOLULU — A new chapter in clean energy is starting in Hawaii. 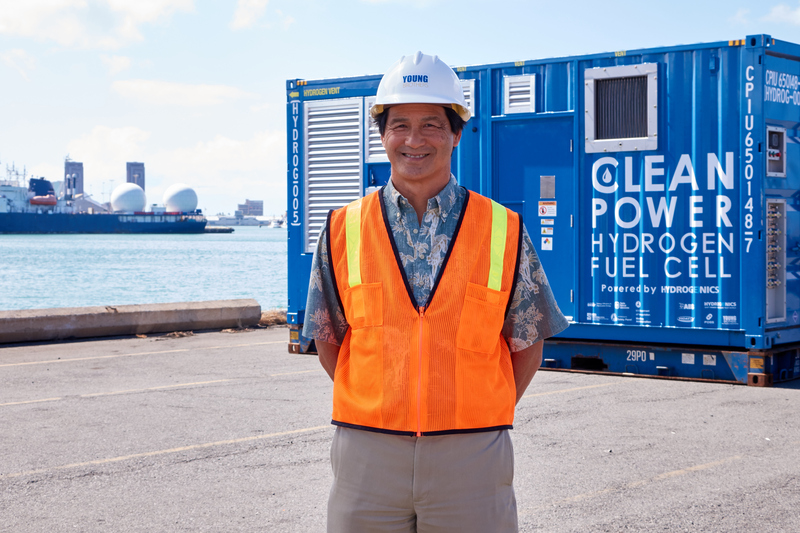 At Young Brothers Ltd.’s Port of Honolulu facility, Sandia National Laboratories is leading the Maritime Hydrogen Fuel Cell project to test a hydrogen-fuel-cell-powered generator as an alternative to conventional diesel generators. The project kickoff was marked with a ribbon-cutting ceremony attended by U.S. Sen. Brian Schatz, D-Hawaii, Young Brothers President Glenn Hong and Sandia California Vice President Marianne Walck. In June, Hawaii Gov. David Ige signed four energy bills, including one that strengthens Hawaii’s commitment to clean energy by directing the state’s utilities to generate 100 percent of their electricity sales from renewable resources by 2045. As the most oil-dependent state in the nation and one that could be most affected by rising sea levels, Hawaii has become an early adopter of emerging technologies and innovative energy solutions. Planning for the Maritime Hydrogen Fuel Cell project began in late 2012 with a study that determined that hydrogen fuel cells could replace diesel generators in providing auxiliary power on board and to ships at berth. The U.S. Department of Energy’s (DOE) Fuel Cell Technologies Office and the U.S. Department of Transportation’s Maritime Administration are funding the six-month deployment of the hydrogen-fuel-cell-powered generator. An analysis by Sandia and DOE showed that due to fluctuating loads in maritime auxiliary power applications, a hydrogen fuel cell, which only supplies power when it is needed, is more energy efficient than a diesel engine. Hydrogenics Corp. designed and built the hydrogen fuel cell generator unit, comprised of four 30-kilowatt fuel cells, a hydrogen storage system and power-conversion equipment, all packaged in a 20-foot shipping container. With 75 kilograms of on-board hydrogen storage, the generator has enough energy to power 10 refrigerated containers for 20 continuous hours of operation. The unit already is providing power to refrigerated containers on shore. Soon it will begin powering the same refrigerated containers on Young Brothers’ barges that distribute goods to Hawaii’s other islands. Young Brothers is a subsidiary of Foss Maritime Co.
Hickam Air Force Base in Honolulu is supplying the hydrogen to power the fuel cell. 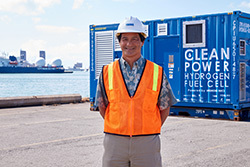 The hydrogen is produced by electrolysis, the process of splitting water into hydrogen and oxygen, using electricity supplied by Hickam’s solar-powered electrical grid. To learn more, visit Sandia’s Maritime Hydrogen website.